The wild Bactrian camel -- a storied animal of the storied Gobi Desert -- stands on the precipice of extinction, according to the International Union for the Conservation of Nature. Despite international efforts to save the animal, it is, said the IUCN, "facing a population size reduction of at least 80% [or, about 800 animals] within the next three generations (estimated at 45 to 50 years)." It holds the dubious distinction of a place on the IUCN Red List, which means that it is "Critically Endangered." Although more slender, the wild Bactrian camel resembles the domesticated Bactrian camel (Camelus bactrianus) even more closely. The wild breed does have smaller humps, a shorter muzzle, shorter ears, a more rufous color, and a somewhat different tooth structure, says Professor W. Leche, Encyclopaedia Britannica. DNA tests have shown other, subtle differences. Still, the two are so closely related that they can cross breed, producing viable hybrids that threaten to eventually displace the wild Bactrian. Size and Weight: Height at the forward hump, 6 to 7.5 feet; length, 10 to 12 feet, including the tail; weight, about 1000 to 1500 pounds. Body: Thick, sturdy body with two back humps that contain, not water, but fatty tissues enriched with dissolved minerals that serve as a reserve for nourishment during periods of sparse food and water. The humps may become collapsed and baggy if the animal suffers a prolonged shortage of sustenance. Head and Neck: Eyes with heavy eyebrows and eyelashes and with see-through third eyelids for protection during sand and dust storms; nostrils with slit-like openings that can be closed tightly for protection; ears with dense hair inside for protection; mouth of exceptional toughness, permitting feeding on coarse plants such as thorny dry shrubs; teeth with canine pairs in upper and lower jaws, permitting chewing of twigs and small branches; neck with enough length to reach vegetation 9 or 10 feet above the ground. Legs and feet: Powerful and relatively short legs that move in unison on each side of the body, giving the animal a swinging stride; broad, two-toed, hoofed feet that have a soft, elastic layer of tissue on the walking surface, facilitating the animal's ability to tread across loose desert sand. Tail: 20- to 25-inch-long, shaggy at the tip. Coat and Color: Shaggy winter coats with heaviest growth on the humps, head, neck, forelegs and tail; sleeker summer coats, after shedding; rufous to dark brown in color; skin dark, resistant to sunburn. Senses: Keen senses of smell and sight. The wild Bactrian camel once occupied much of the vast Gobi Desert and steppes, or dry grasslands, that spread across the Chinese and Mongolian borderlands. Now divided into three or four subpopulations of perhaps a 1000 individuals total, according to the IUCN, the camel occupies a much reduced range, in northwestern China and southwestern Mongolia. Well adapted to temperature extremes (minus 40 degrees Fahrenheit in the winter and more than 100 degrees Fahrenheit in the summer), intense sand and dust storms, sparse and diverse food sources and limited water supplies, the camel inhabits rugged territory. Migratory, it ranges from "rocky mountain massifs to flat arid desert, story plains and sand dunes," linking its movements to water availability, says EDGE (Evolutionarily Distinct and Globally Endangered). A herbivore with a tough mouth and specialized teeth, it feeds, preferably, on plants such as grass, grains, leaves, roots and nuts, but it can also eat more coarse materials such as wood, bark, stems and thorny foliage. If exceptionally hungry, it may feed on dead animals' hides, flesh and bones. Given the opportunity, it may even eat humans' sandals, cordage, blankets and tents. Typically, the animal feeds in the mornings and evenings. A ruminant, it regurgitates partially digested food and chews again (chews its cud) in the afternoons. The wild Bactrian camel can survive days without water -- several times longer than a human could survive -- although it may lose a third of its body weight. It can meet some of its water needs by eating green plants, if available. When drinking, it can consume 15 to 30 gallons of water within a matter of minutes. Unlike other land mammals, it can quench its thirst with salty or brackish water. Based on limited research and observations of the animal in the wild, it appears that the wild Bactrian camel lives in family groups that include a dominant male (stallion), several females (mares) and offspring (calves). When a young stallion leaves the family group, it may associate with a bachelor group or live in isolation until it can establish its own family group. In the mating season, usually mid- to late winter, the dominant stallion grows surly. He may bite a competing stallion. He may spit on his rival. He may even try to sit on him. According to authority Judy Evans, "Characteristics of the Bactrian Camel," he emits a foul-smelling substance from glands on the back of his head. He urinates on his back legs, using his tail to flick urine over his back. His testicles enlarge. The mare, meanwhile, urinates on her back legs, using her tail to flick urine over her back. The two mate once the mare signals her readiness by kneeling on her four legs. The stallion then seeks other mates. Some 13 months after mating, typically in early spring, the mare bears one, or, occasionally, two calves. Fiercely protective, she may nurse her newborn for a year or more. She may nurture a calf for several years, until it reaches maturity. She will bear new young only every other year. A newborn calf develops rapidly, standing on its gangly legs at birth and walking with the species' swinging stride within hours. A stallion reaches sexual maturity at 5 to 6 years of age, a mare, at 3 to 4 years. 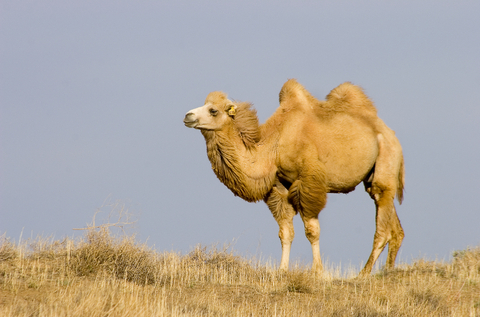 In the wild, the wild Bactrian camel may live for 30 years or more. During centuries of relentless human intrusion, the wild Bactrian camel has been displaced from vast parts of its historic range. It has suffered a severe decline and fragmentation of its original population. Within the remnants of its original range, the remaining animals must compete with domestic livestock for grazing and water in a degraded habitat. They face still more habitat loss, now to industrial and mining operations. They become poisoned by potassium cyanide, a toxic by-product of illegal gold mining. They suffer dozens of losses annually to the rifles of subsistence and sports hunters. They lose their genetic distinction when they cross breed with animals from nearby herds of domestic Bactrian camels. With help from the Wild Camel Protection Foundation, China and Mongolia have set aside reserves as protected habitats, not only for the wild Bactrian camel, but for a wide range of threatened Gobi Desert animals and plants. Hopefully, they will succeed. Bactria, which gave the camel its distinctive name, was an ancient country in what is now northeastern Iran. Camel-like animals evolved in North America more than 46 million years ago, and modern camels' ancestors migrated to Asia across the Bering Strait land bridge some 3 to 4 million years ago. The camel became extinct in North America some 8 to 10 thousand years ago. Unlike any other mammal, camels and their closest relatives have oval-shaped rather than circular red blood cells. The Bactrian camel was probably domesticated about 4000 years ago, and today the domesticated species numbers well over a million. By comparison, domesticated dromedary camels number more than 12 million.